The Combo (Inch & Metric) Thread Checker™ is an accurate and easy-to-use thread identifier for both nuts and bolts. 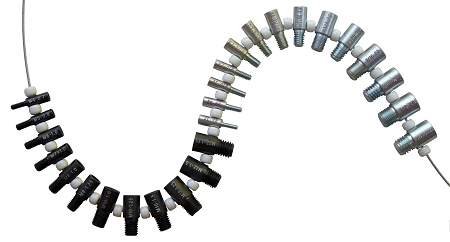 Each individual gauge features a male threaded stud on one end and a female threaded hole on the other. The Thread Checker is especially well suited for distinguishing between similar inch and metric threads. Conveniently assembled onto a wire loop, it's the perfect portable solution! Hang it on your shop wall or store it in your tool box for safe keeping. The Thread Checker, also known as a Thread Identifier or Thread Verifier is a great addition for any Home, Hobby, or Inventor's Work Shop; Auto, Motorcycle, Marine, ATV or RV Repair Shop; Heavy Equipment Repair Shop, Military Equipment Repair Station, Machine Shop, Fabricating Shop, Assembly Department, Production Department or Quality Inspection Station! You can rest assured, these tools are made for the long haul. 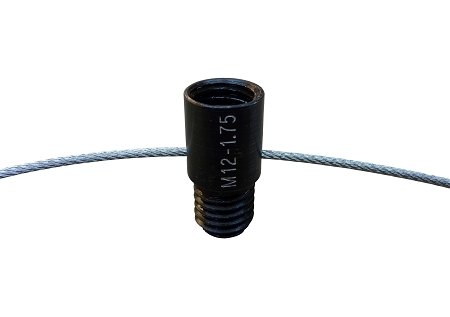 Manufactured from heat-treated carbon steel with the thread sizes permanently stamped onto each gauge, it will take some serious heavy duty use before we get the opportunity to fill your next order. Proudly made in the USA. Good price for both metric and inch bolt checking , better than the plastic plate thread checker I have plus you can check both male and female threads. Fast shipping and best of all it’s made right here in America. Had a couple of nuts and bolts on my car that I had to replace and some were metric and sae but I wasn't sure of the size.These thread checkers were just what the doctor ordered! Great purchase! Great tool, saves lots of time, should have bought one a long time ago. Love this! Saves so much time knowing exactly what I need with respect to thread pitch and size. Hangs on my peg board and is easily accessible. Fast and easy access to a thread checker really speeds things up. This is what you need if bolts and nuts need to be identified quickly.